A World Health Assembly statement also recommended that countries limit misleading ads for baby formula. The U.S. had a problem with it. The benefits of breastfeeding over formula are clear and are not controversial, so advocates expressed surprise and dismay Monday over a report that the U.S. sought to suppress a World Health Assembly resolution supporting it. The New York Times reported on Sunday that U.S. delegates to this year's gathering of the assembly, the decision-making body of the World Health Organization, fought to weaken a resolution declaring that a mother’s breast milk is the best food for infants and discouraging misleading advertising for formula. "We are stunned by reports of U.S. opposition to a resolution at the World Health Assembly this spring aimed at promoting breastfeeding," said Dr. Georges Benjamin, executive director of the American Public Health Association. "The scientific evidence overwhelmingly supports breastfeeding and its many health benefits for both child and mother." It’s not controversial to promote breastfeeding, the American Academy of Pediatrics says. The benefits are clear. “The American Academy of Pediatrics recommends breastfeeding as the sole source of nutrition for your baby for about six months and can be continued for as long as both mother and baby desire it,” the group, which represents pediatricians, says on its website. The group said there was "unequivocal evidence" that breast milk protects against infant diseases and conditions including bacteria in the blood, diarrhea, respiratory tract infection, necrotizing enterocolitis, ear and urinary tract infections, some types of cancer, and childhood obesity. Breastfeeding benefits mothers, as well. “Mothers who breastfeed recover from childbirth more quickly and easily. The hormone oxytocin, released during breastfeeding, acts to return the uterus to its regular size more quickly and can reduce postpartum bleeding,” the group says. 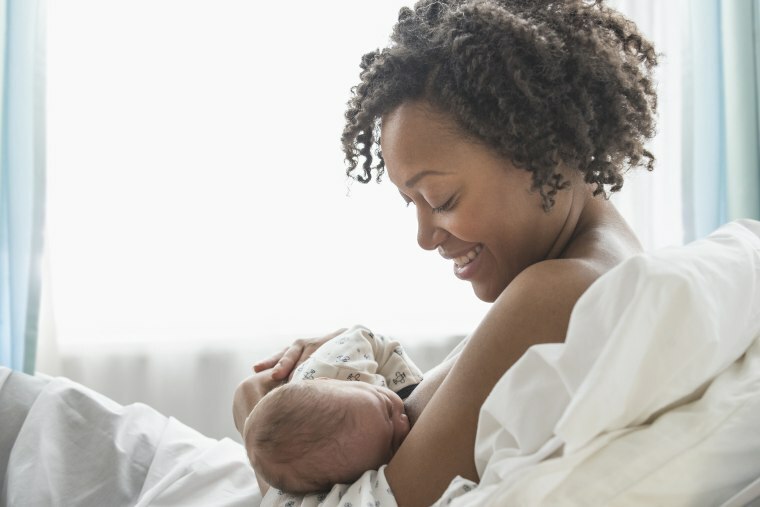 Kristin Rowe-Finkbeiner, executive director of the advocacy group MomsRising, expressed surprise at the report that the U.S. fought what should have been a straightforward resolution supporting breastfeeding. “Members of MomsRising thought it was shameful, ridiculous and flat-out wrong that our country came out opposing breastfeeding and that our country tried to remove the language asking governments to protect, promote and support breastfeeding,” Rowe-Finkbeiner told NBC News. A 2016 survey found that more than 80 percent of new mothers breastfeed their babies in the U.S. but that fewer than a third keep it up for a year. The move to encourage breastfeeding specifically targeted formula companies, which once dominated the market for parents of newborns. In 2007, close to 73 percent of U.S. hospitals handed out packs of free formula, bottles and coupons — familiar to just about anyone who gave birth in the 1990s and early 2000s. Since hospitals started discouraging the practice, that number has fallen, to just over 30 percent of hospitals in 2013. But formula is still often pushed in other countries, particularly developing countries, and the World Health Assembly resolution would have addressed often-misleading ads, said Patti Rundall, policy director of the British group Baby Milk Action. “Nobody denies that the infant formula, which is for the newborn babies, is a legitimate product that should be made available to women who don't want to breastfeed or have problems or whatever. Nobody denies that,” Rundall told NBC News. “They make a lot more money if they can add nutrients and additives and health claims on a product, put it in a plastic-type container and sell it,” she said. On Monday, President Donald Trump tweeted that the U.S. simply wanted to protect women who need formula for their babies. New mothers often find it difficult to breastfeed even if they want to, Rowe-Finkbeiner said. The resolution supported policies making it easier for them to do so. “Right now in the United States of America, women aren’t fully protected who want to choose to breastfeed,” she said. Three-quarters of mothers are now in the labor force, she added. Yet many are denied the time or the place to pump milk at work. If a woman goes too long without expressing breast milk, it will start to dry up. “In the middle of that fight for access, we have Donald Trump, the president of the United States, directing the entire world to go backwards,” Rowe-Finkbeiner said. Despite its efforts, the United States did not significantly change the resolution, the Times reported. Both versions are available online. The original version calls for WHO to "help eliminate inappropriate marketing of foods to infants and young children". The final version reaffirms "that breastfeeding is critical for child survival, nutrition and development, and maternal health" and calls on member states "to continue taking all necessary measures in the interest of public health to implement recommendations to end inappropriate promotion of foods for infants and young children."